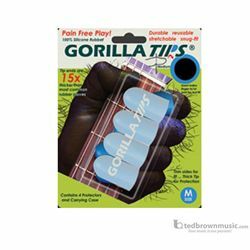 Gorilla Tips Fingertip Protectors are a handy tool for guitarists that hate the pain in their fingertips after playing for hours, that have trouble developing callouses or even beginners who haven't been playing long enough to develop them. These provide protection and comfort without sacrificing your finger's natural feel on the fretboard. IMPORTANT! For proper fit, first determine your finger size. 1. Wrap a thin paper strip or string around the first joint of your INDEX finger and mark at the overlap point. 2. Measure the length from end to the mark. 3. Compare your measurement with the guide below to determine best fit size.